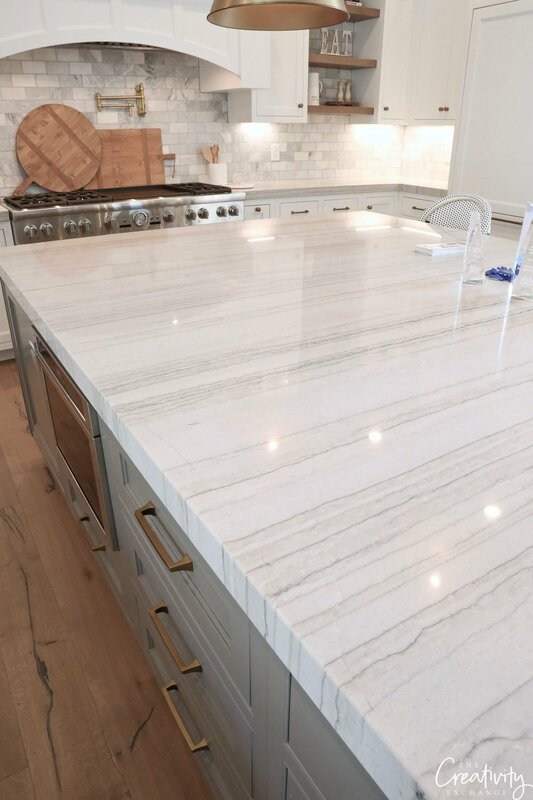 A couple years ago, I toured one of the most beautiful homes I have ever seen in Salt Lake and the kitchen was truly extraordinary. I will say it’s probably the most beautiful and well designed kitchens that I have ever seen! 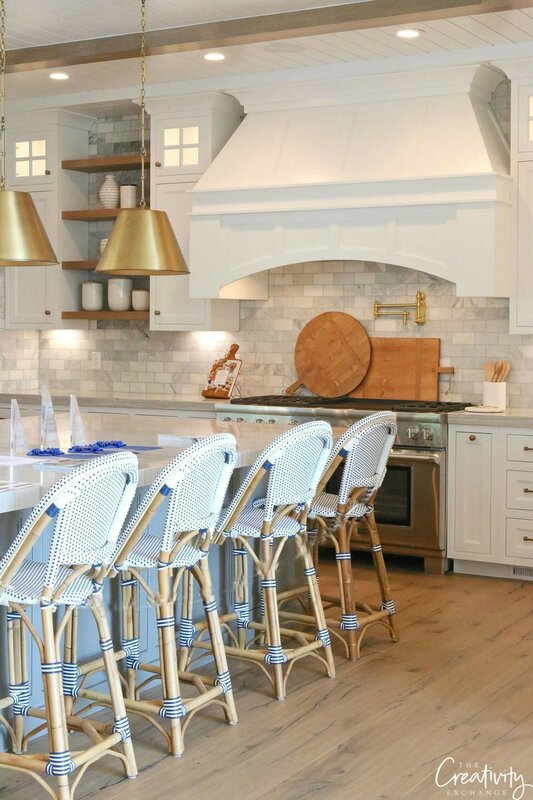 I have only shared one or two pictures from this kitchen on the blog (as a recap of the SLC Parade of Homes) and you would not believe how many requests that I have received to share more of this modern European meets farmhouse dream kitchen! I went back and found the rest of the images and today I’m sharing a tour of this amazing space! 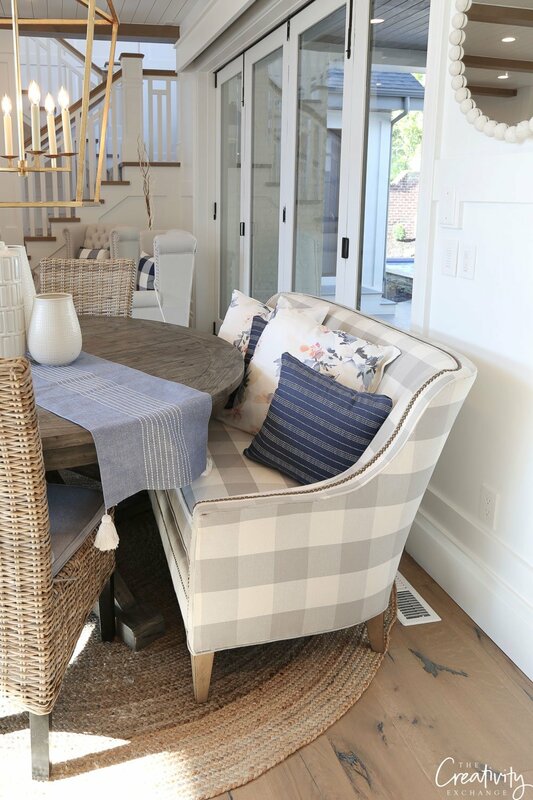 Before I jump into everything, the home is located in Salt Lake City and was built by Silverhawk Enterprises (designed by Heidi Ann Design). Silverhawk Enterprises is a fantastic builder and since I toured this particular home back in 2017, I have had the pleasure of seeing several other Silverhawk homes built in the area and have been so blown away by the consistent craftsmanship of this builder with each home! If you live in Utah and need a builder, you should really consider Silverhawk for sure! 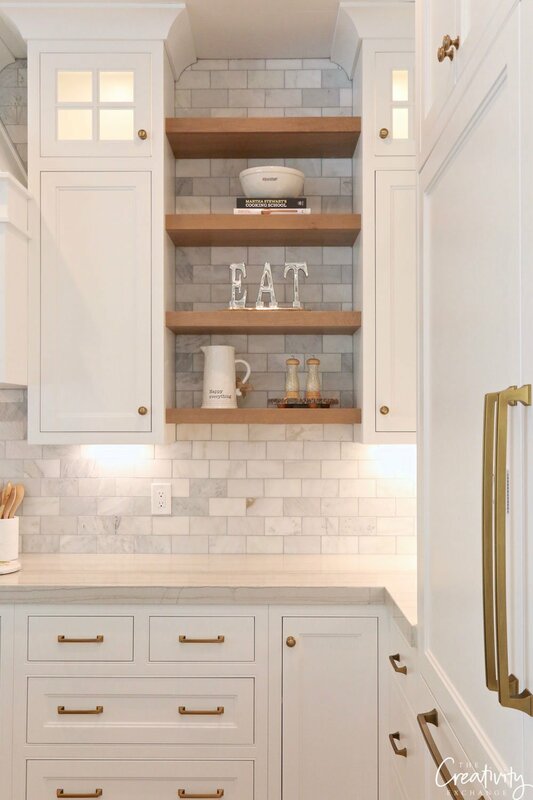 One of the things I loved the most about this kitchen were all the little details. So much thought went into every little detail in this space from both a design and functionality standpoint. 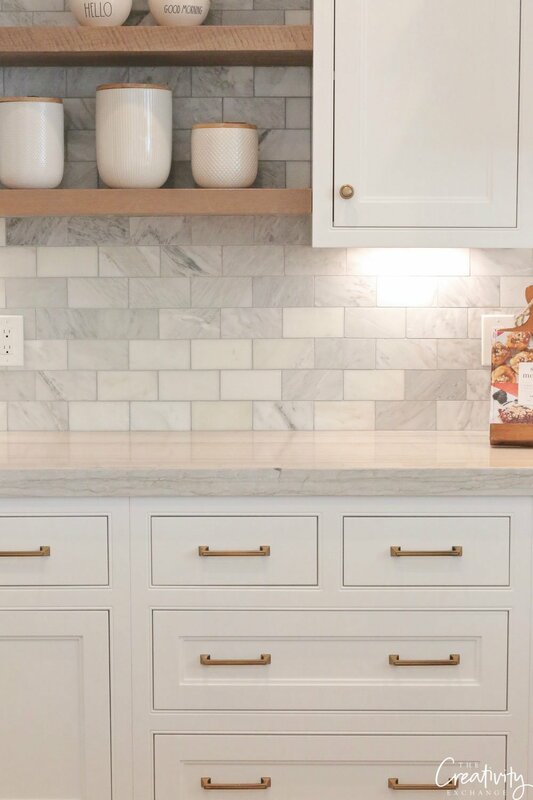 While this is a large kitchen, every square inch in this space was maximized beautifully, which is what really inspires me more than anything when it comes to design. The chefs kitchen is open to the living/dining areas and is perfect for entertaining. 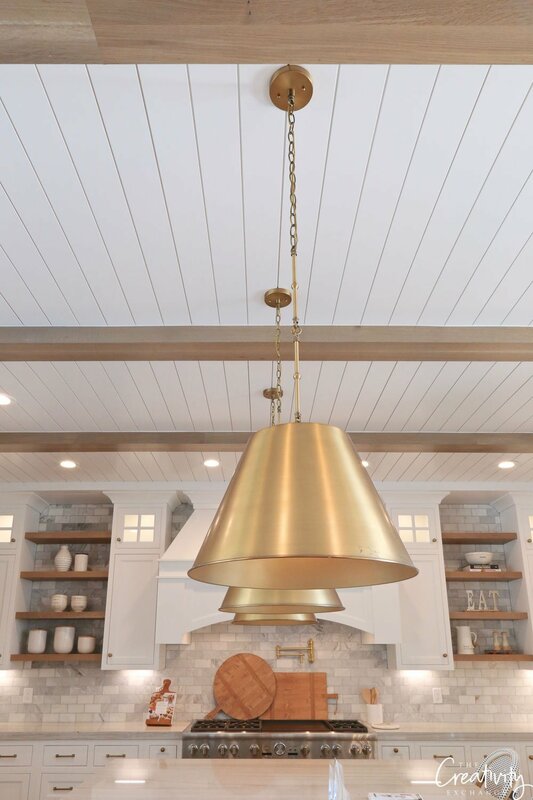 Notice the shiplap ceiling overlaid with oak beams. So beautiful and fresh! 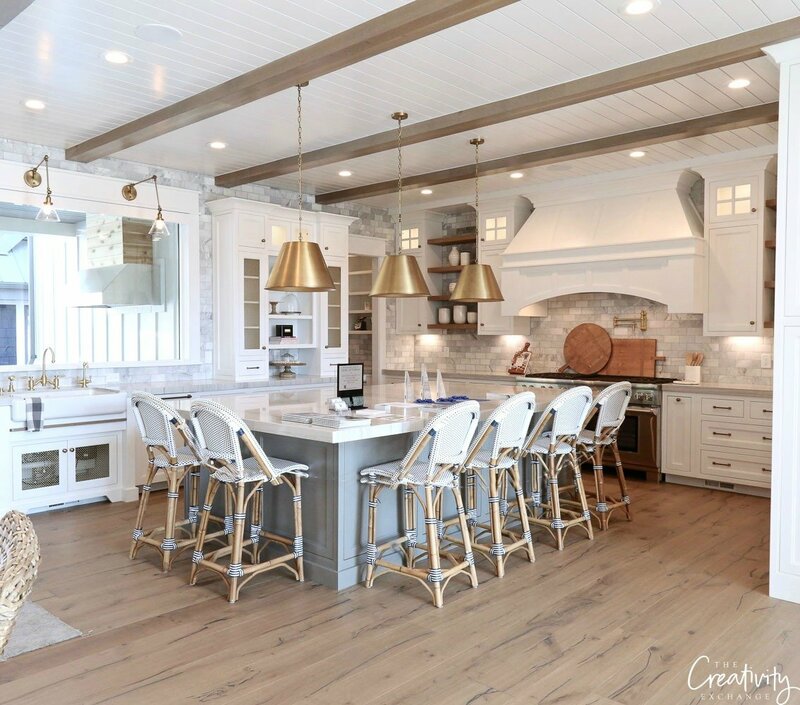 The builder carried the gorgeous 7″ wide European Oak through the kitchen, which was breathtaking. 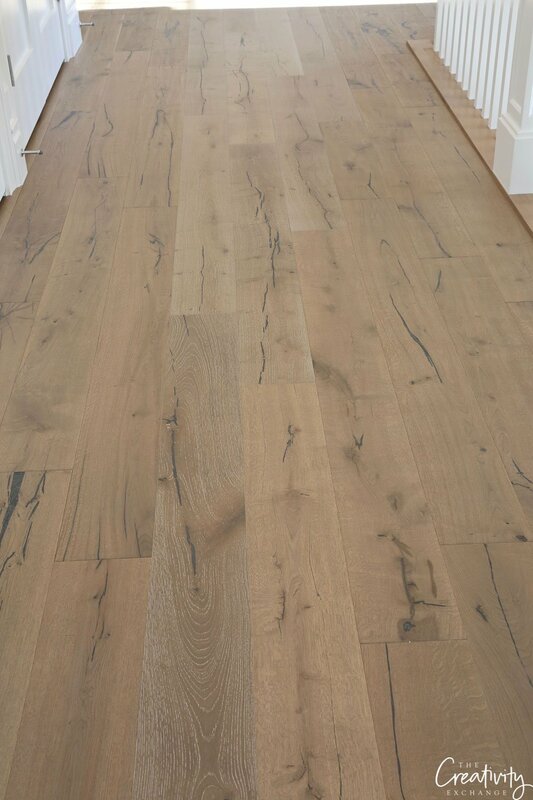 Here are some shots of the flooring throughout the home to really show you just how beautiful this floor is. 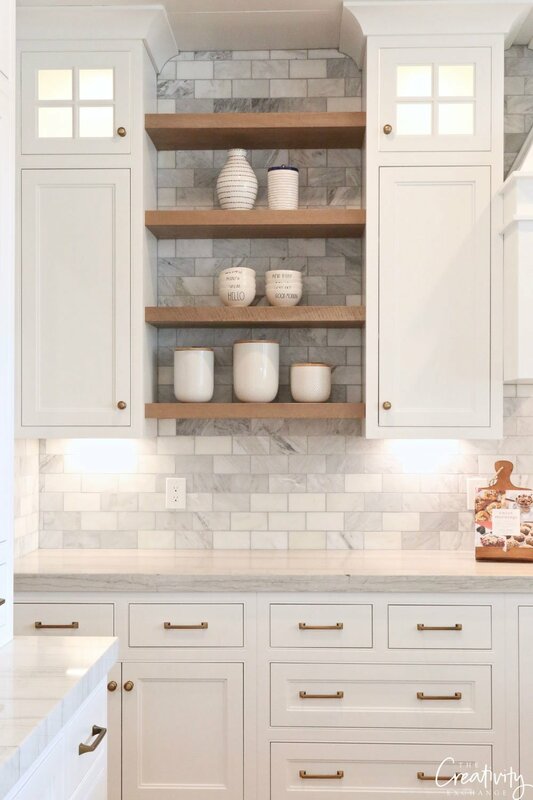 The builder not only carried the wood floors through the kitchen but they accented the kitchen with the same wood oak color in the floating shelves that warmed up the kitchen mixed with the white and marble backsplash. 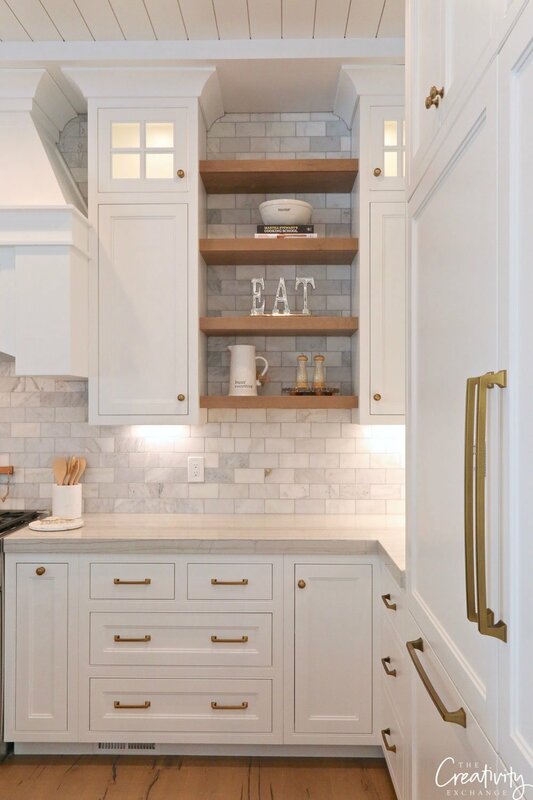 Kitchens that have total open upper shelving (while pretty) are simply not practical in the long-term and the builder here compromised by doing a combination of open and closed upper shelving. Such a smart and a stunning compromise! 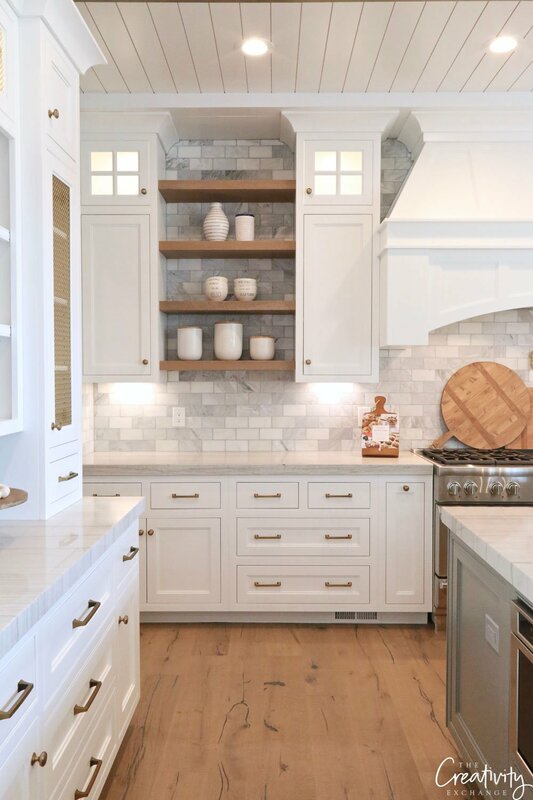 I also always love to see kitchen cabinetry carried all the way up to the ceiling and you would be surprised how often I don’t see that in new construction. 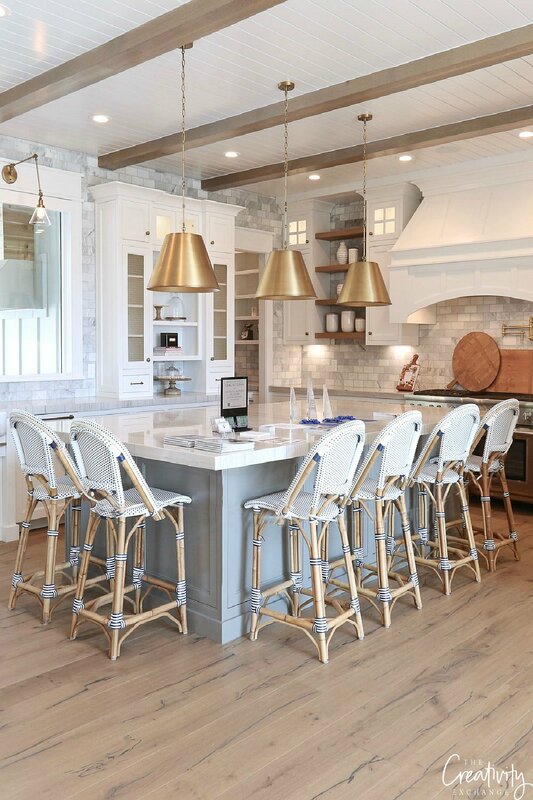 The huge center island is a dream for cooking and family gatherings! This island comfortably seats six with plenty of deep drawers and storage on the opposite side of the island. 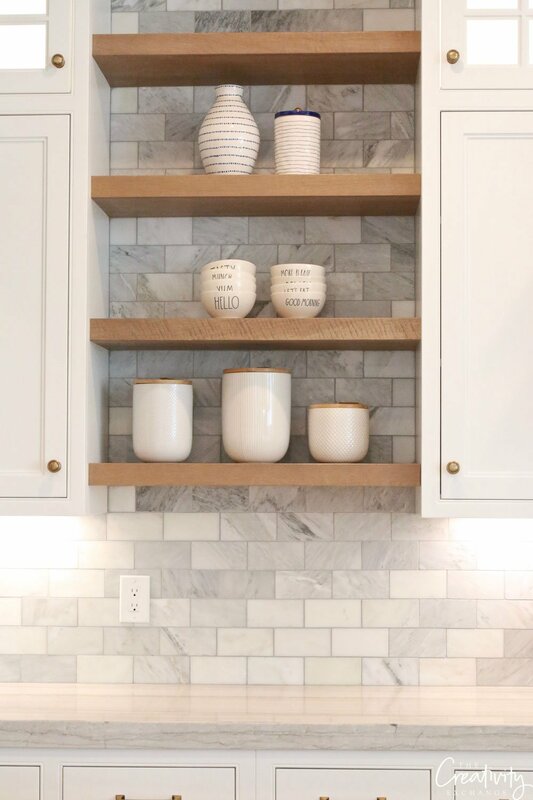 This was the first time that I had ever seen marble subway style tile used as a backsplash and I loved it so much mixed with oak floating shelves and the white cabinetry. 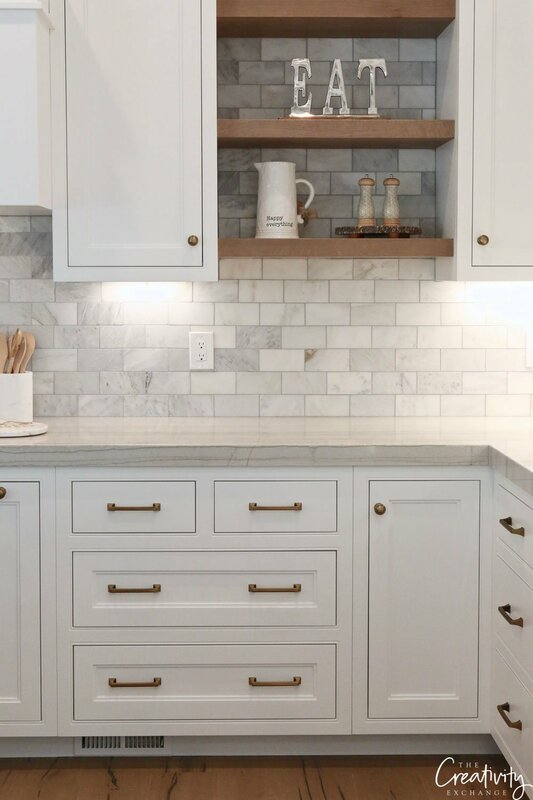 This kitchen had a lot of creative storage solutions that were customized for how the homeowners wanted to utilize the kitchen. 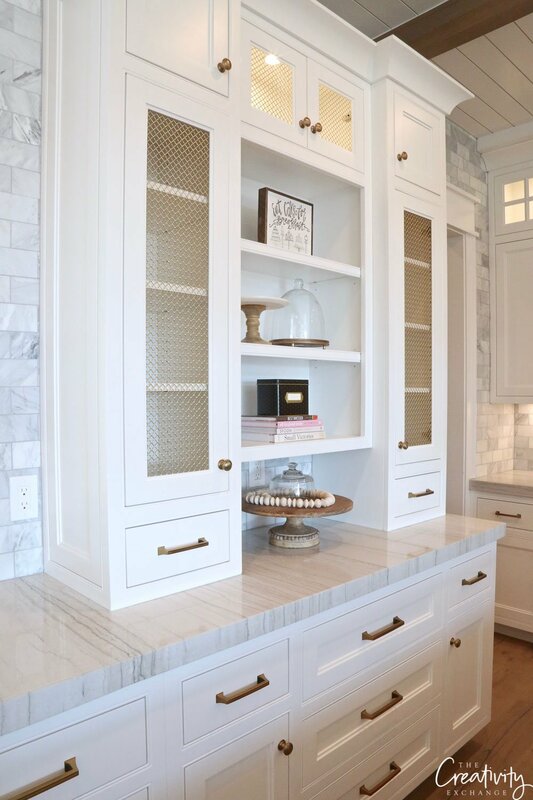 I always love to see plenty of storage in the kitchen for dishes and serving ware. 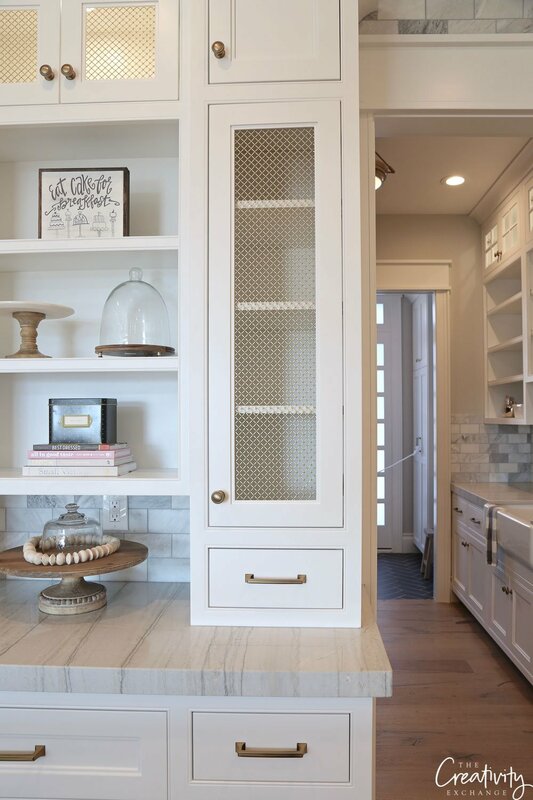 It makes it so much easier when entertaining not to have to go to dining room storage for special dishes or large serving pieces. This built-in has storage for everything! Just look at this detail! 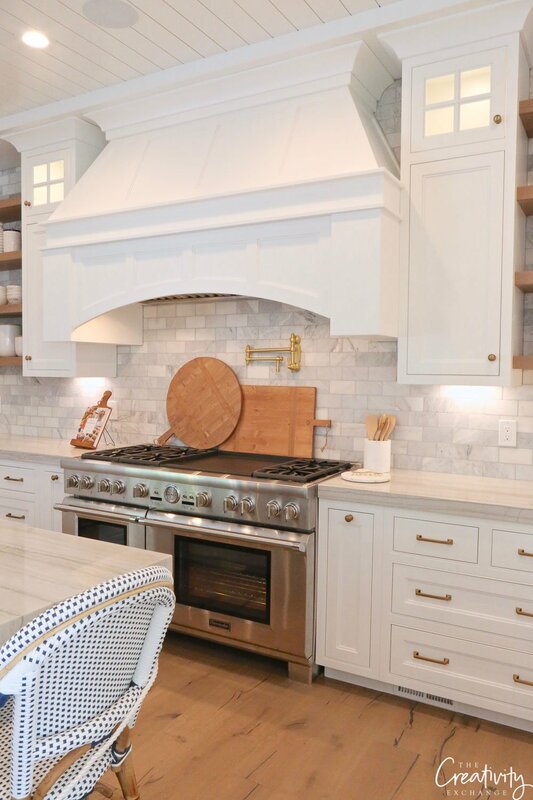 The custom European inspired vent hood over the range is absolutely stunning and notice the beautiful detail of where the cabinetry trim work meets the ceiling. It’s one of the first things I noticed when I walked into the kitchen because it’s so detailed and different. Off the kitchen on the left side was a large pantry with it’s own sink. Hello!! 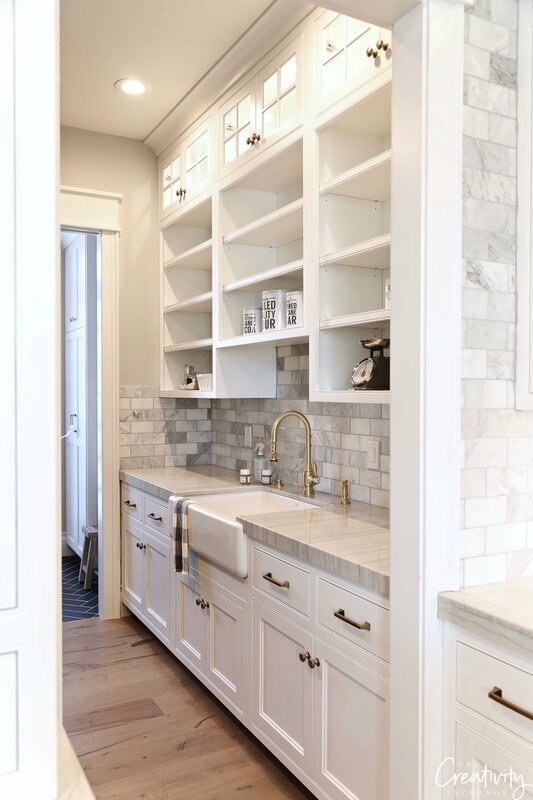 I would give anything to not only have a large pantry like this but a separate pantry sink! There were floor to ceiling pantry shelves opposite the sink, which I did not get a picture of but look at all that great storage over the pantry sink. What a dream! 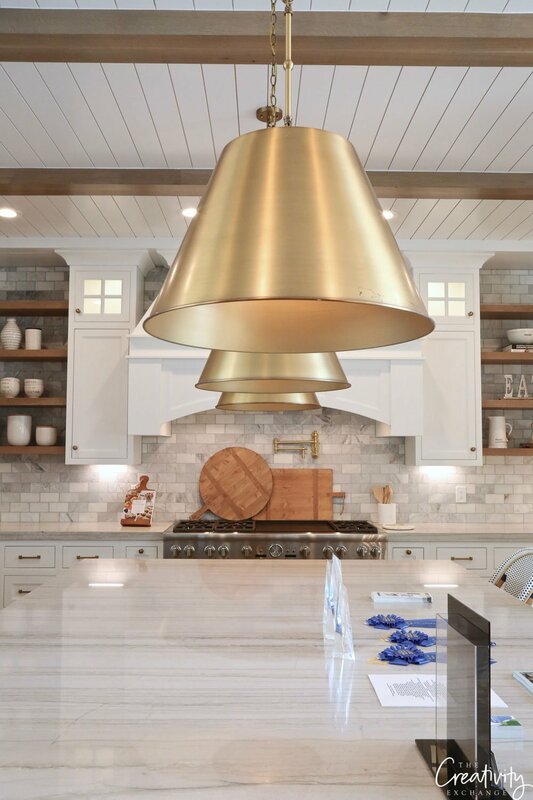 I also loved the polished brass and brush gold tones carried through the kitchen and pantry fixtures including faucets, cabinetry hardware and lighting. 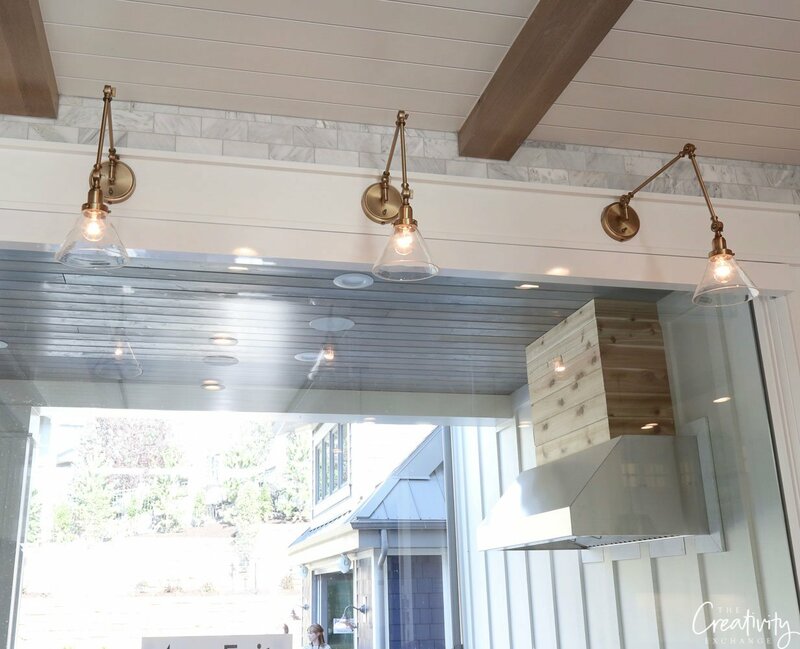 I’m seeing more and more new homes adding swing arm sconces overhead to add additional light, which is smart and beautiful. 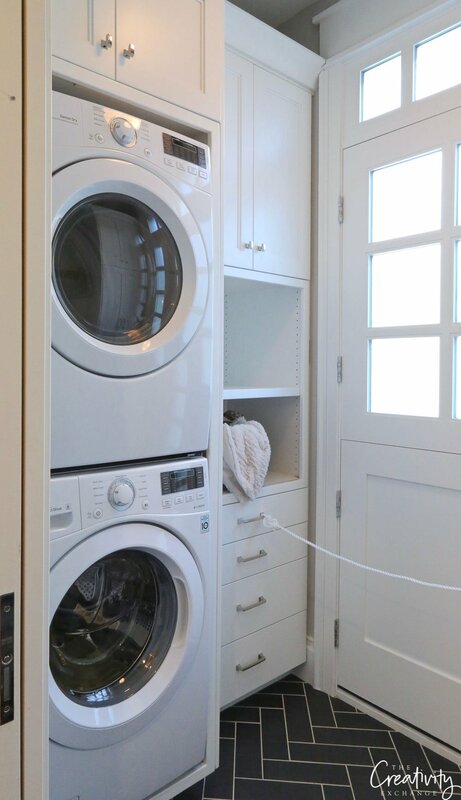 While this home had multiple laundry rooms, it was so smart to add a small laundry right off of the pantry/kitchen. 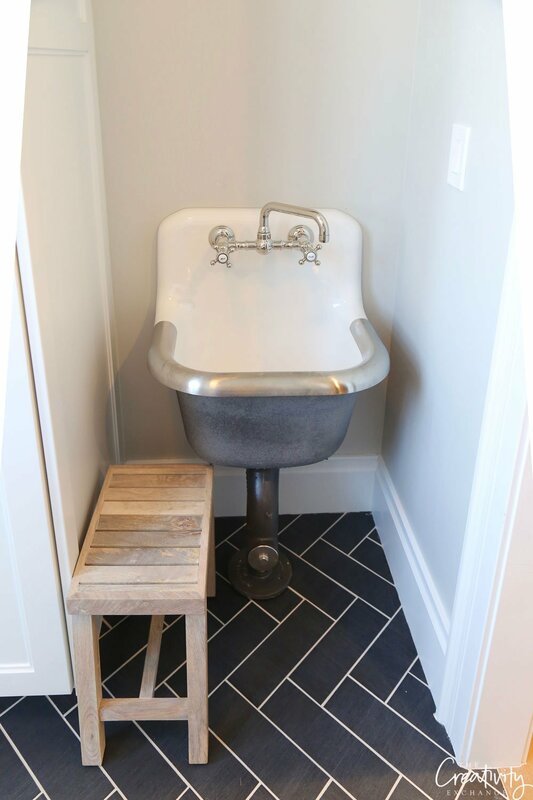 The black slate herringbone floor in the kitchen laundry spot was a beautiful touch! 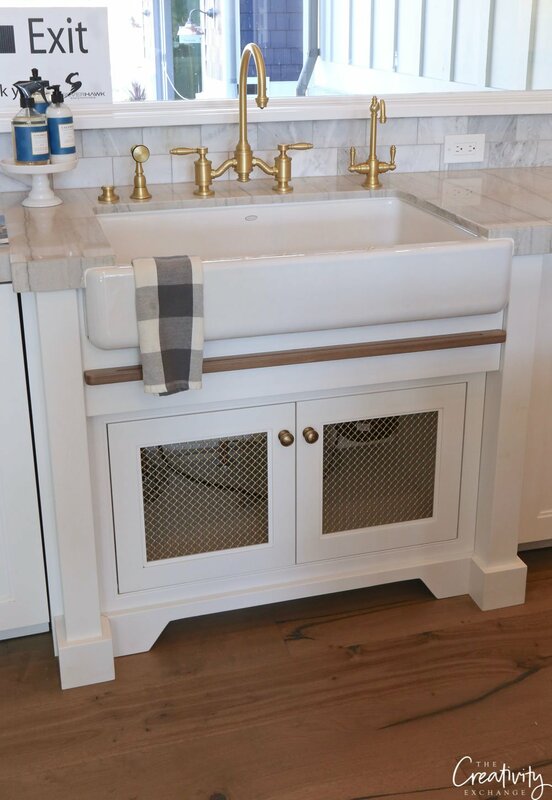 Also in the kitchen laundry was the cutest vintage style sink placed low for kids to wash hands. Adorable! As you head back into the kitchen and off to the left side, there was a kitchen nook type area that was beautifully layered. It really was such a special treat for me to tour this beautiful home and spend time visiting with the builder. Silverhawk Enterprises is doing some really amazing work in the Utah area and I’m thrilled that I was able to tour this project. 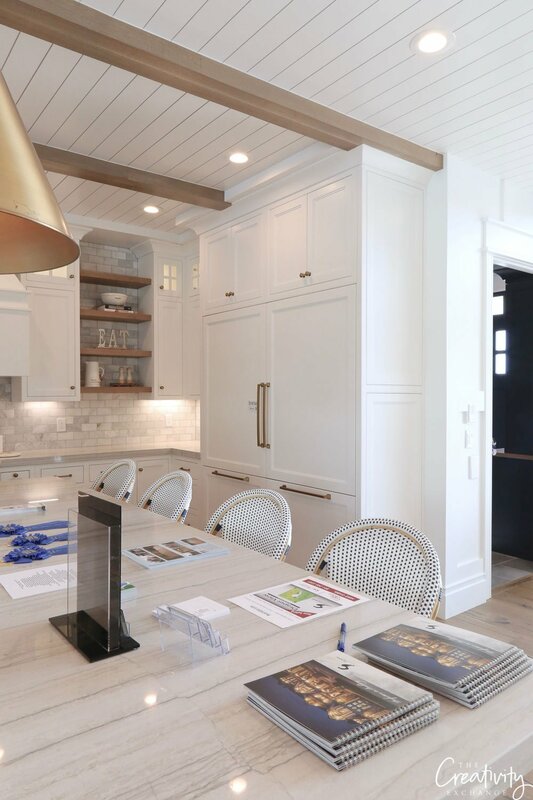 If you want to see more of this home, you can see a few more pictures from my SLC Parade of Homes recap here. 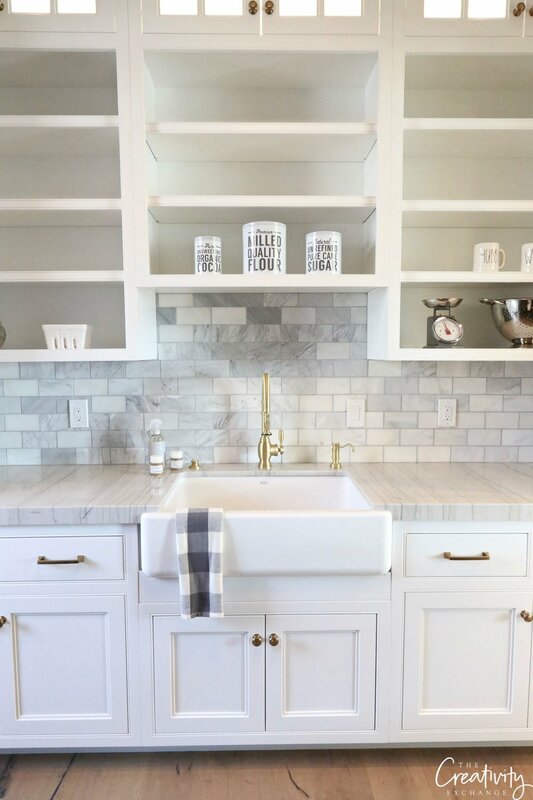 Love the kitchen – thanks for sharing. Do you have any information on the wood floors or the Laundry room floors? I’m so glad you loved the tour! 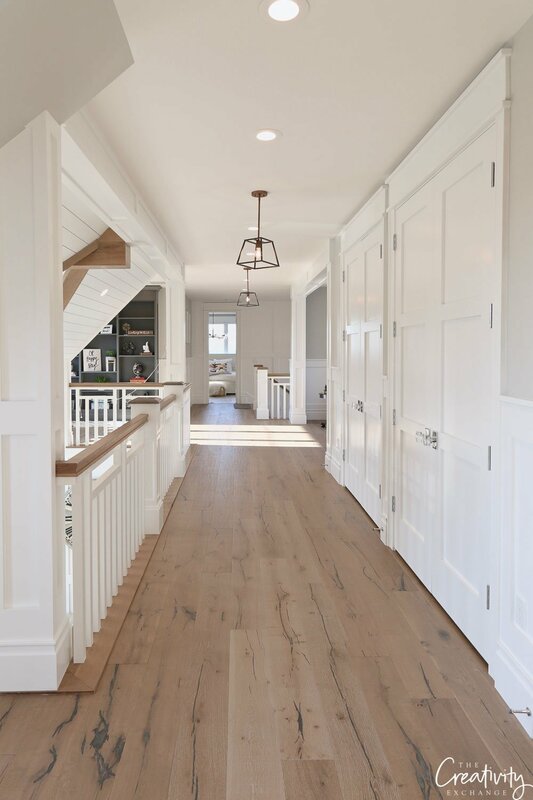 Unfortunately, I do not have the brand name of the floors but from my notes talking with the builder, he told me that they are hand scrapped 7″ width European oak. They were probably the prettiest floors that I have ever seen. Absolutely breathtaking. 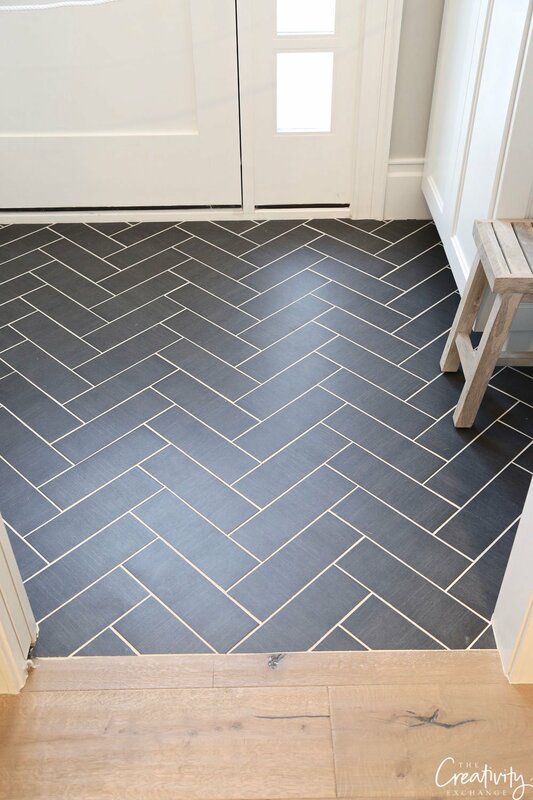 If you want to find out more about the brand of the floors, I’m sure if you sent an email to Silverhawk they could give you more info on the floors throughout the home and the black slate herringbone in the pantry laundry room. Thanks for stopping by! 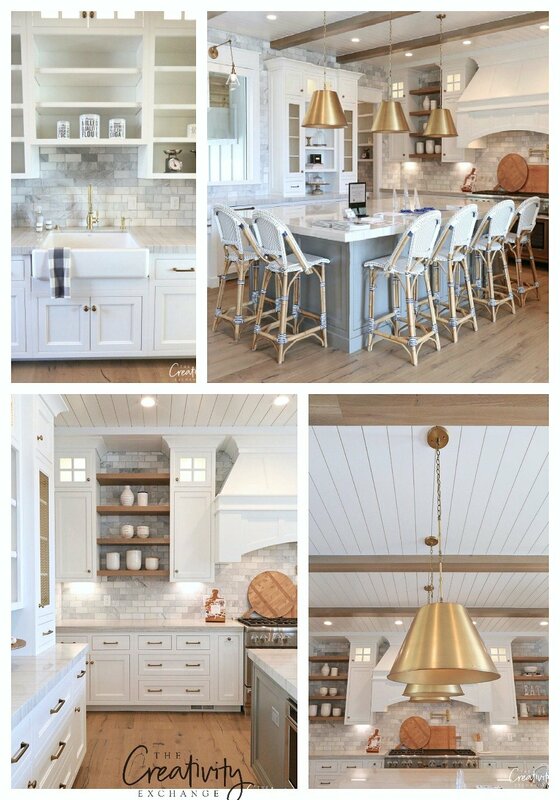 Shiplap/farmhouse isn’t what I’m typically drawn to but WOW, this is a beauty and there are more than one takeaways that I’ be happy to have in my home! The only decision I question is why they put wire doors on the sink cabinetry. I keep “everything but the kitchen sink” in this cabinet at my house and sure wouldn’t want it to be seen! I love all the features of this beautiful home. Thanks for sharing! I normally go for that minalmist contemporary look . But I enjoyed seeing that beautiful house . And can appreciate all the craftsman ship in design and work . Loved this!!! 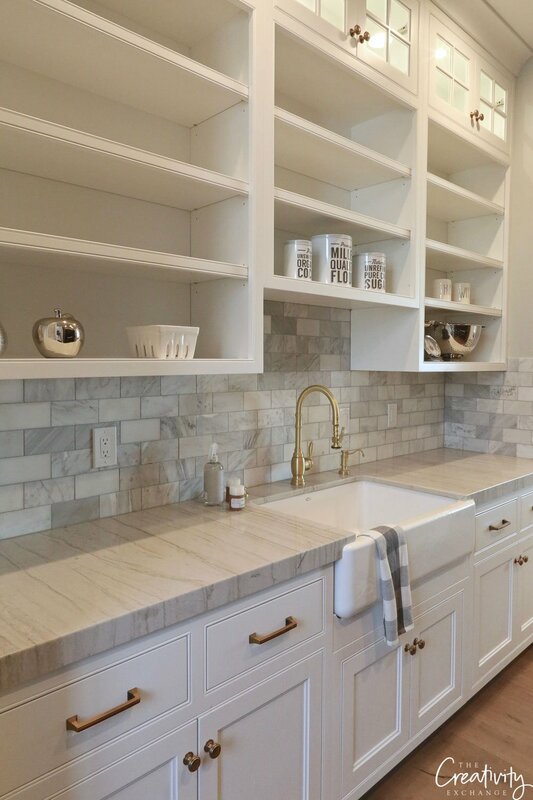 What kind of countertops are those in the kitchen? I love you the floors – where are they from? So beautiful! 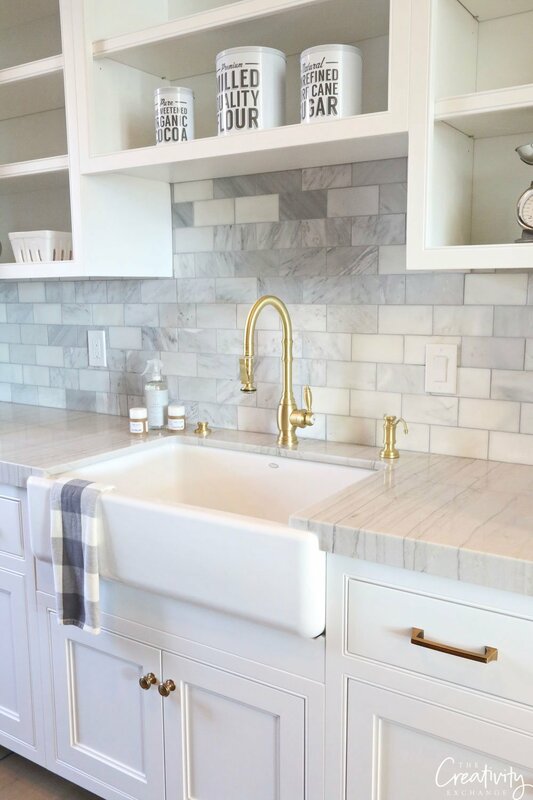 Do you know what kind of countertops those are? Currently building and this is such great inspiration! Hello! This is the most beautiful kitchen I’ve ever seen. Do you know what hardware brand is that was used? This kitchen is unbelievable! 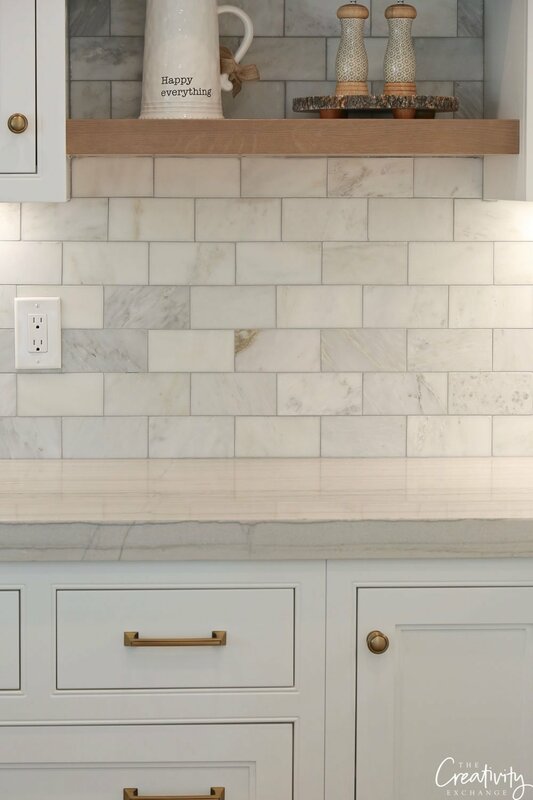 Can you tell me what the counters and island are made of? I’m about to renovate my kitchen and would love that info! Thank you for posting these pics!